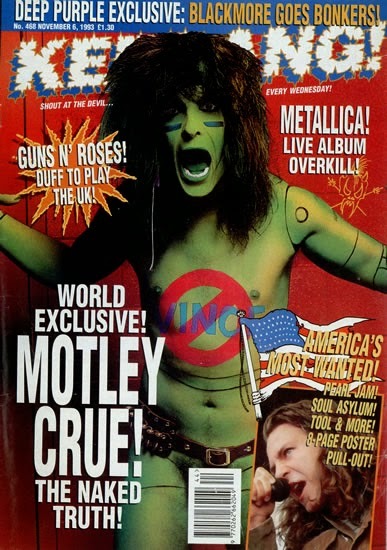 This is an issue of the rock magazine Kerrang from the early 90’s and it features Motley Crue bassist, Nikki Sixx on the cover. The masthead of the magazine reads ‘KERRANG’ in big, bright, bold and fuzzy letters. It immediately catches your eye and it matches with the whole rock genre of the magazine. The main image is Nikki and he is bright green and seems to be shouting with his mouth wide open, this suggests he is loud, enthusiastic and outspoken. He has also been painted or digitally colored in green, this also catches our eye and makes us think why is he colored in green, his personality? Or just for effect? And on his jest reads ‘Vince’ with a large ban symbol over it, Vince is his former bandmate so we can infer from this sly dig at Vince that there is some form of turmoil within the band and this will make us want to pick up the magazine and read the article. The magazine cover itself despite the main image is very eye catching and there are many things on here that jump out at you. The article heading, “WORLD EXCLUSIVE! MOTLEY CRUE! THE NAKED TRUTH!” sits next to the main image in bright white bold letters an jumps out at us, it seems very loud with all the exclamation marks and when I read it in my head it seems to shout. Also the heading “BLACKMORE GOES BONKERS” is clearly visible when you see the front cover due to its bold yellow writing, this appeals to us because of the word bonkers, we want to read on and find out what made him bonkers. And it is even more appealing because it is a celebrity or someone famous in the music business. The background of the front cover is red and red connotes anger, hate, rebellion and loud, so this matches with the rock theme of the magazine and goes well with the rebellious Nikki Sixx featured on the cover. Good deconstuction. Strong understanding and knowledge of the media theory, and good use of termminology. Could be much betterly structured.